After the first round of 26 Palestinian pre-Oslo prisoners were released by Israel in August, as a concession to renew peace talks, the Guardian published three celebratory photos, in their Picture Desk Live series, all showing the prisoners being reunited with their families. The captions used for the photos all failed to even mention the Israeli victims of the crimes committed by the freed Palestinians. Now, as Israel begins the painful process of releasing the second group of 26 pre-Oslo prisoners, the Guardian’s coverage continues to highlight the released terrorists while all but ignoring their victims. 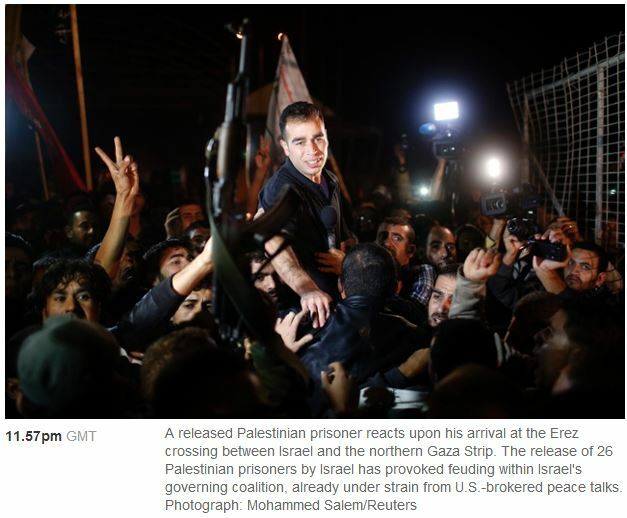 The Guardian also added a video of Palestinians celebrating the prisoner release (to accompany an AP story they published today) that included an image of what appears to be the same man in the photo above. Though both the caption and video failed to identify the freed Palestinian, other sites indicate that he is Shabbir Hazam (aka, Shabir Kassam Taher Hazam). Shabbir Hazam, born in 1974, was a member of Fatah and a resident of Gaza who was arrested in 1994 and sentenced to life imprisonment for (along with an accomplice) murdering a work colleague – Isaac Rotenberg from Holon – with an axe. As we’ve noted previously Isaac Rotenberg, born in Poland, was a Holocaust survivor. Most of his family was murdered in the Sobibor death camp, but Isaac managed to escape and joined the partisans. After the war he tried to make his way to mandate Palestine, but was interred by the British and sent to a detention camp in Cyprus until 1947. After his release Isaac arrived in pre-state Israel and fought in the War of Independence. He continued his work as a plasterer even after pension age and in March 1994 was at his place of work in Petah Tikva when he was attacked by Shabbir Hazam (and another Palestinian worker) with an axe. He died, aged 67, two days later. Whilst the Guardian’s coverage of the prisoner release continues to highlight the joy of the freed terrorist and their families, the Jews (and Palestinian ‘collaborators’) they murdered continue to largely remain nameless and faceless. You’d think they were imprisoned for blowing their nose in the wrong direction on the wrong day, FFS. The decision to release the 26 triggered anguish and anger in Israel, where many view the men as terrorists who killed Israelis. “where many view the men as terrorists who killed Israelis.” Such mealy mouthed, mean-spirited words. Do they mean by that to call into question the objectivity of the Israeli justice system (a system which enables a panel of judges including an Arab judge to convict a President)? To suggest that these murders did not happen? Or to suggest that the deliberate murder of Israelis by non-nationals is somehow NOT terrorism? They ought to explain which. They can’t. It would let too much daylight in. “Hazem Shubair, who was jailed in 1994 for the death of an Israeli, according to the Israeli Prison Service, was overwhelmed upon his release to Gaza. “I am speechless,” he said. “Thanks to God. God is greater than the aggressors.” Earlier his brother Tayser called Hazem a “freedom fighter”. So he was jailed “for the death of an Israeli” (translation: he hacked to death an eldery man who had surviced the death camps) “according to the IPS” (translation – perhaps he was REALLY imprisoned for his political beliefs?). He was called by his brother a “freedom fighter”. I may be wrong, but to me a freedom fighter is someone who bravely stands up to an oppressor. I am not sure I can agree that this term is apt for a man who toojk an axe to the body of a 74-year-old work colleague. Further: “God is greater than the aggressors”. Just who is the aggressor here? The 74-year-old plasterer and Holocaust survivor? The man who hacked him to death simply because he was a Jew? Or the state that tried him in open and independent court and convicted him to a long term of prison as punishment for that crime? I know which of those I would call the agressor, and it isn’t the first or the third! “God is greater than the aggressors.” This statement really says it all about this brainwashed axe murderer. Men who talk this way and act on it simply shouldn’t be walking around free. Have you seen this in the Independent? In my opinion they’re worse than the Guardian. He is obviously in very good physical condition too, thanks to Israeli prison-life. I know the same cannot be said of his victim who survived the Nazis, only to be brutally murdered in his homeland. ” There is of course a great deal of blatant antisemitism in the mass media. But it is also good to be aware of the subtle ways in which antisemitism is pushed by the major media outlets. Why? Because, once it dawns on you how carefully antisemitism is inserted into the smallest details, you will realize that it is everywhere, and that it is there by design. “What you see to the right is a recent example of ‘News Summaries’ that the well-known British magazine The Economist regularly sends out. You’re making a connection between the Protocols and Jimmy Carter? That’s a baseless and rather nasty slur. I listed several articles that describe essential aspects of the Western media’s libelous propaganda campaign again Israel. The convergence of the racially motivated cold-blooded murder of Isaac Rotenberg with the barbarism of Nazi crimes that devoured the rest of his family in Europe is lost on the Guardian and Britain’s liberal intelligentsia. Playing down, excusing or just simply ignoring the former is an indictment against those progressive minds who do not see the present as a development of the past, and are themselves a product of the moral black hole that lies at the heart of a continent that brought us the Holocaust. In other words, for Rudsbridger and co. the murder of defenceless Jews in the name of a brighter future is something to empathise with rather than condemn, and where appropriate, join in the celebrations.